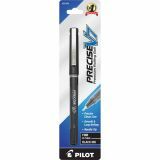 Pilot Precise V7 Rollerball Pen - Precise V7 Premium Rolling Ball Pens write through layers of copies. Patented Precision Point Technology and unique liquid ink formula deliver an even, continuous flow of ink for incredibly smooth, skip-free writing. Ink color matches barrel color. Pen offers a large, visible ink supply for longer writing capacity. Pens are nonrefillable.